Here’s a great real-world example of this effect. The act of one man affected every one of us. On July 2, 1863, a 34 year-old schoolteacher saved the Union in a battle at a small town named Gettysburg. Shocked by the boldness of the Union men, many Confederates threw down their loaded weapons. The rebels were certain that these soldiers were reinforcements and not the same men. In less than five minutes Chamberlain declared to a Confederates captain, “You are my prisoner.” Within five more minutes, 400 Confederate soldiers had surrendered. Historians tell us that if Chamberlain hadn’t charged on that day, the rebels would have won at Gettysburg and the South would have won the war by the end of the summer. From the miraculous birth of George Washington Carver to biblical characters such as Gideon and King David to even you and me (! ), MANY stories can be told of how single acts, and often SMALL acts, changed the course of lives and nations. 2 Peter 3:8 says that to God, “a day is like a thousand years.” To God each moment of time, no matter how infinitely small, can open the door to huge life changing power – even to the glory of God. Each moment can be the time that the butterfly might flap its wings and create a hurricane on the other side of the planet! Each flap of our wings matters all the way into eternity! A related word of advice: Concentrate your efforts on what you can influence, NOT on what you’re concerned about. By so doing, you will expand your circle of influence. If you concentrate your efforts on what you’re concerned about, your circle on influence will shrink. Nevertheless, PRAY about all things! Much information taken from “The Butterfly Effect” by Andy Andrews, which can be ordered from simpletruths.com. To become the butterfly that can effect the world, one must first give up being a catepiller and begin looking up instead of down! So true, Wayne. We look up “from whence comes our help” in order to receive the true vision of who we can become. I take it that you are a fellow butterfly! Very interesting way to paint a clear picture of God’s power moment by moment….. I absolutely love it. So true, Amanda! Moment by moment or “flap by flap” of the butterfly’s wing! God is certainly in the smallest of moments; and ALL of God is in the smallest of moments, whether or not we notice them. Amazing! I agree! Just read this, Mi Cielo is away for her niece’s Bachelorette party for an overnight with the her sister’s and the two nieces. Praying it will be break thru, and enjoyable time of refreshment for them. Want to meet with you after the big session. I loved this article. Cannot think of Butterflies without thinking of Rom 12:1-2. 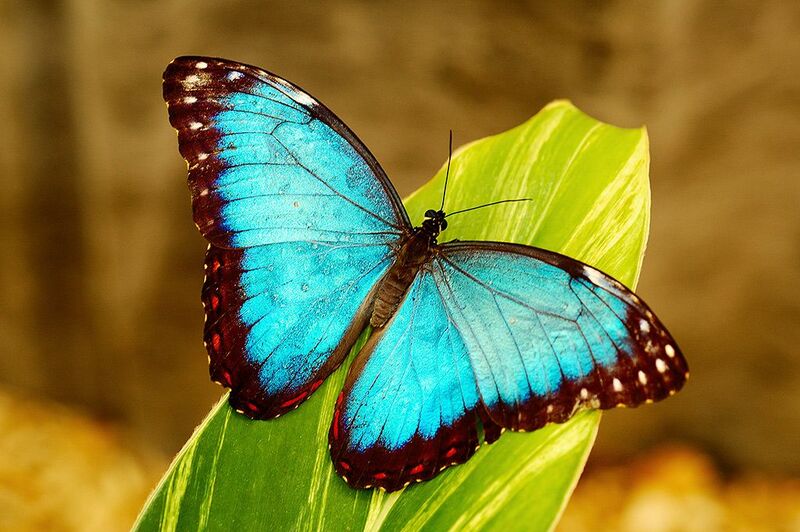 How amazing is our God to have the power to transform a lowly caterpillar into a beautiful Butterfly. How much more amazing is it that he can do the same for us as we emerge from the cocoon. Keep writing, dear brother, encourages more people than you can ever know, I am sure. You are truly a good butterfly, beautiful too. and yes you do have a special way of attributing nobility to each life you touch and you do draw that nobility out. A true gift from God. Scott, Thanks so much for your comment. Yes, through faith we can all morph into butterflies. I also loved the analogy and the illustration. I know that you have a similar call on your life and that you help to ennoble and encourage people to follow Christ and to be and do all that God created them for! God bless you, my brother! I have learned that if I flap my mouth, I can start a hurricane that goes around the world! (Or at least my little world.) It can be positive or negative, but it seems the negative effect goes farther, faster and lasts longer than the positive. If the positive flap is accompanied with positive action, it has the propensity to at least catch up!